The cause and effect diagram is also referred to as the Ishikawa diagram after its originator or the “fishbone diagram” because of its appearance. The cause and effect diagram is used to document the possible or potential causes of a specific problem or event. 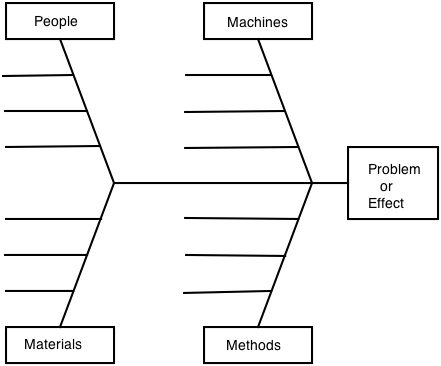 The four diagonal lines labeled “People”, “Machines”, “Materials”, or “Methods” represent the four major categories of potential causes. Each possible cause is written on one of the horizontal lines joining the appropriate diagonal. This diagram is frequently used to organize the results of a “brainstorming” or idea generation meeting in which the participants attempt to think of as many things as possible which might cause the problem or effect in question.